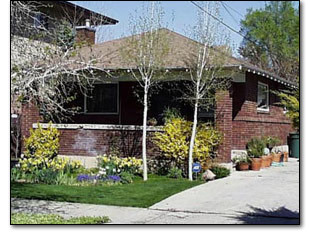 The popular bungalow style was adapted to both expensive and modest budgetsthink Greene and Greene to Sears or Aladdin ready-cut mail-order homes. It was due to this adaptability that bungalows spread across the country filling entire subdivisions with charming, practical homes. Known for their low roofs with generous overhangs, deep porches, and honest architectural elements, bungalows were intended to be built with natural, site-specific materials, and to blend into the environment. A "Western" bungalow designevoking America's vision of a pine wooded Westcould mean a home with dark green shingles on the second floor and brown horizontal siding at the first floor, all trimmed in brown. The "natural look" was by no means law, however. Similarly styled houses could have pale yellow stucco and white trimcolors more suitable to the bright skies and white beaches of Florida or Southern California. This area was originally all farmland and as such the soil is a rich, dark brown. In fact, the original farm house for the area is just one block to the north and is a three-story red brick home with a turret on the front facade. This photo was taken after I finished the first big projectputting on a new roof. I had to strip off one layer of asphalt and two layers of cedar shingles before putting down new underlayment, a ridge vent, and new asphalt shingles.